Fieldfare (Turdus pilaris). Taken at Abingdon, Oxon., on March 1st 2018. Taken at Abingdon, Oxon., on March 1st 2018. 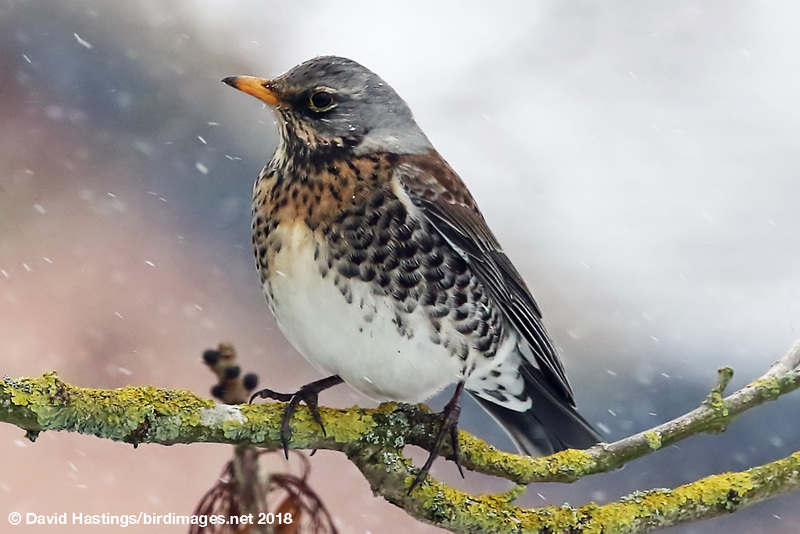 Fieldfares are large, colourful thrushes. They stand very upright and move forward with purposeful hops. They have grey heads and backs, and black tails. They have white undersides which are spotted black, and ochre chests. The sexes are similar. They can be found throughout the British Isles from autumn to spring. They breed in Scandinavia and eastern Europe. They feed in large flocks on open fields and other grassy areas. In bad weather they feed on berries. Fieldfares are very sociable birds, and flocks can be hundreds strong. The Fieldfare is a Red list species. Around 725000 birds over-winter in Britain.